Tracing the existential path of a lone man stalking a mysterious creature through the dystopic spaces of a world gone to rust, Cristiano Gazzarrini’s sci-fi short US invites its audience to immerse themselves in a primordial, shifting conflict between hunter and prey. 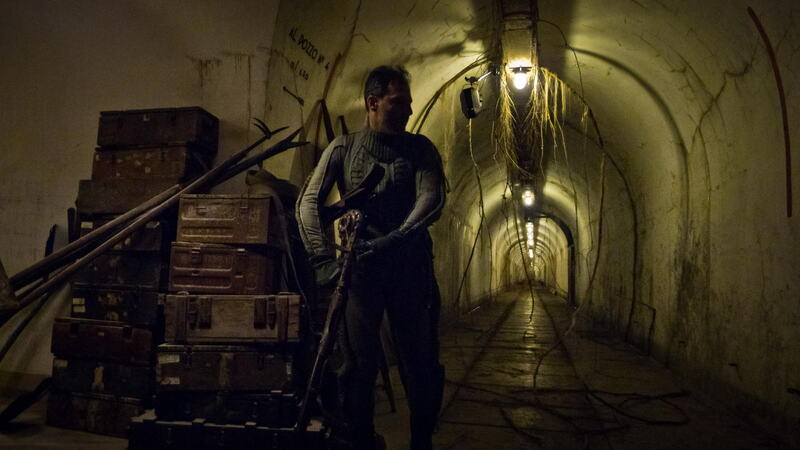 With US making its online premiere today, DN spoke to Cristiano about the quadraphonic origins of his post-apocalyptic story and how matching his grand, artistic vision for the project led his team to epic but highly challenging shoot locations. Where did the idea for this deeply allegorical sci-fi story come from? US was first conceived during a quadraphonic session by Aerosfere: a live sound experience, where sounds reach an audience immersed in complete darkness from different angles; thanks to these conditions and to the long experience, it is possible to enter into a meditative state. The first image which appeared to me was that of a naked man meandering in a cave, lit only by the flames of his torch, a vision which recalled the origins of mankind. From that moment on, the various phases of the story appeared: the man’s journey along a rising itinerary towards the light, passing through the remains of a civilization in ruins. And against him, an antagonist creature who inhabits those places and may be a product of that destruction. US is an allegory of the existential path of the human being through a conflict, against himself and against the context that surrounds and determines him. The objective was to tell a story which has ancestral and universal dynamics, which can be interpreted on different levels so that the viewer is spurred to introduce and overlay his own experience in order to interpret the film completely. So I suggest to everyone interested to experience it to watch US in the best viewing conditions: dark ambience, headphones and on a TV if it is possible. Were there specific references you invoked to convey the look and feel of US to your collaborators? I spoke with Valerio Comparini, an artist outside the film industry and especially the sci-fi/fantasy genre because I wanted the weapon to have a look unrelated to any other references of the genre. We talked about the world in decay in which the story was set and afterwards about ideas: the elements given were that the weapon should be part of that world, it must seem archaic and simple but at the same time should suggest a mysterious mechanism. I did research on weapons in history and then we were inspired by the steampunk universe but we took away all its typical patina and the sense of ‘just made’. After the first meeting, I heard nothing from him for two months, until he reappeared one day with the weapon: it was practically ready and with just a few changes, the gun was created. All the rest was missing, but the biggest feat was behind us! Because when you have an element, even a small one in a vast chaos, it becomes like a reading key for a ciphered universe. When you have an element, even a small one in a vast chaos, it becomes like a reading key for a ciphered universe. Davis Becheri, the DoP, was able to create the amazing mood of the photography, letting himself be transported by the locations. He wanted to work with natural light, trying to reduce the use of artificial light as much as possible to reproduce the real ambient atmospheres. The excellent work of the Production Designer Francesco Bacci was almost exclusively performed by assembling and moving objects that were already in context to make a greater realism in the scene. The whole infirmary room, where the protagonist finds the suit, was assembled from scratch exclusively with objects found inside the gigantic hydroelectric power plant, with the exception of the ‘talking mask’ which was also created by Valerio. In general, we never used references from other movies, we always worked with our imaginations and drew from the cultural and experiential background of each team member to try to create an original vision. Given that you had such clear images of your protagonist’s surroundings, how difficult was it match those imagined spaces with physical locations? Were there any limitations that made them difficult spaces to shoot in? The three locations, all connected to the theme of work (and consequently of the passing of time) bear witness to a long gone civilization, visually remote from today; they inspire a reflection on the relationship between man and environment and on how this determines his existence. These are not only locations where the action takes place: the places themselves are the action and determine the action with their own dynamics and meanings. We basically looked for three locations: a cave, a corridor and an abandoned factory. We had a single reading key: the rust. 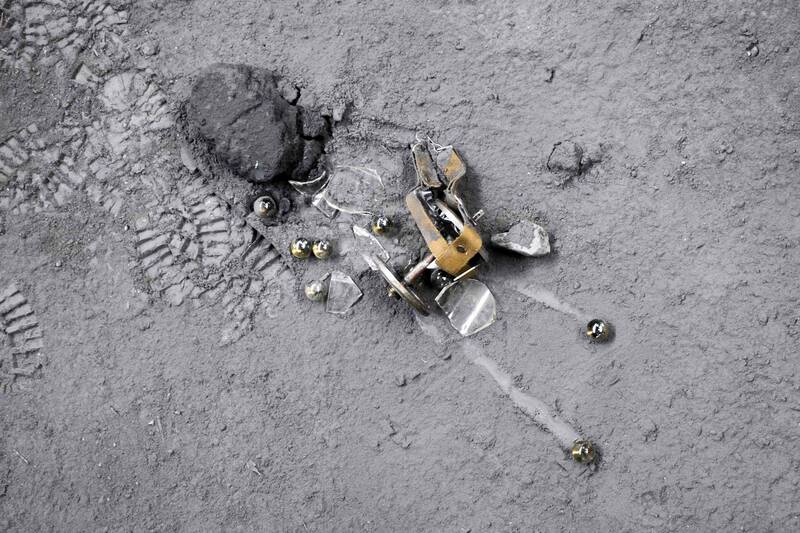 Everything had to deal with the decomposition of an extremely strong material such as iron. We wanted to represent a society that once had been very strong but was now in decay. When you are preparing a film, or any other project in your life and you get these signals you have to listen to them and move forward. For the cave we did a couple of location hunts with a speleologist friend. Once identified I studied the staging based on the location. For the corridors I already knew the location so the screenplay was written thinking about that reference. The most amazing thing was the gigantic hydroelectric power plant. We found it after two years of research and when I saw it I thought it was not possible: it was practically as I had imagined it! When you are preparing a film, or any other project in your life and you get these signals you have to listen to them and move forward. So I did, despite the difficulties that these locations would create for the shoots. The cave is an abandoned marble quarry: the top of a mountain excavated by man. Inside it, an endless succession of spaces, from an entrance hall as big as a cathedral, to the very narrow passages, where filming was extremely difficult because of the flames’ fumes which made the air unbreathable. The temperature inside was 10°C, when outside it was 30° C. The hardest part, besides the lack of light which made even walking difficult (there is no artificial lighting and each troupe member had to have their own light), was reaching the cave itself. It is on the top of a mountain and can only be reached with a 30 minute hike (lugging all the material on our backs). The infirmary and the bomb shelters are part of a museum created within a former S.M.I. ammunition factory in Tuscany, at Campo Tizzoro, the biggest in Europe, operative between 1911 and 2006. The factory was so big that a whole town was built to accommodate the families of the workers, with kindergartens, schools and facilities such as movie theatres and soccer fields. 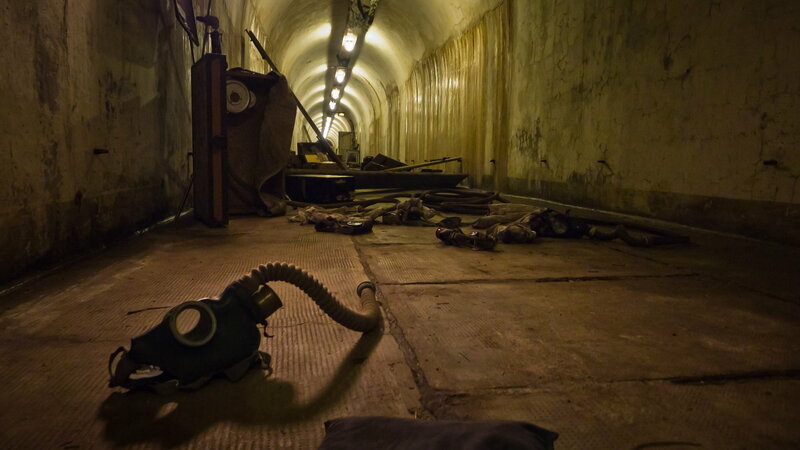 Because it was a military target during the second World War, 5 kilometres of tunnels were built 20 metres underground, capable of sheltering the town’s population (around 6000 people) for a few days. Part of these underground shelters have been restored and are now open to public, under the direction of the I.R.S.A. and of Gianluca Iori, architect and sponsor of the museum. The greatest physical effort was that of moving all the materials (technical and set design) through a 1.5 meter-wide spiral staircase, a 5-minute climb each time. For two days, we filmed at 12°C while outside it was 28°C. 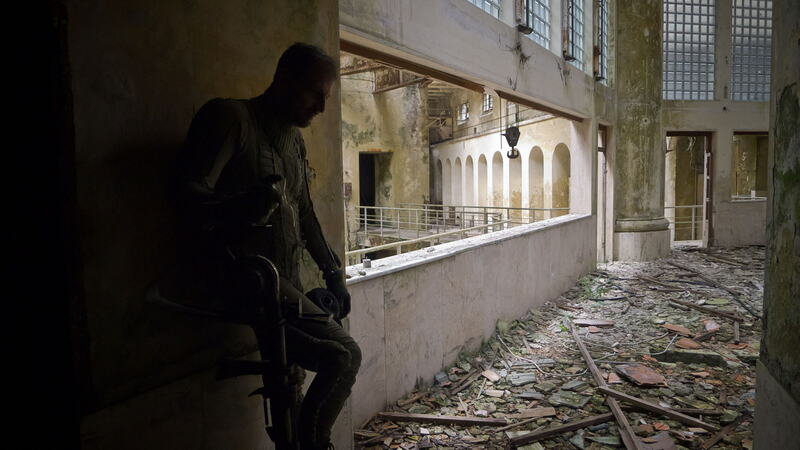 The final part of the film takes place inside a large abandoned industrial area in central Italy: the electrochemical plant, the hydroelectric plant and one of the largest abandoned industrial buildings in Europe, all set in Papigno. Often, between the script writing and the actual filming, settings are rewritten and adapted to what is found during location scouting. In our case, we discovered that what had been described in the script actually did exist. The locations were absolutely perfect and in most of them there was no need for lighting or any other set design feature. The support of Terni’s local administration, who understood the project’s goal and were open to collaboration, was fundamental. Through a careful re-writing of insurance policies, we were granted the necessary authorizations to access these facilities, some of which had never been filmed by a production crew before. How did you select and then work with your cast for these largely wordless performances? For the main character casting, I gave the actors three inputs: birth, growth and death. I let them improvise without words. During the session I played the soundtrack of the short at a very high volume and at a certain point, suddenly, the weapon appeared on stage. Then I watched the way the actors related to it. Rosario Campisi, is a clever theater actor with a very solid education and a long experience of stage. With him we felt comfortable right from the beginning. He is a curious person who likes to get to the bottom of the concepts. There was a continuous comparison of questions and answers. It was not easy for him to build a character without any past or future. I wanted a character who lived the story for the first time. In fact we left a lot also to the improvisation that came from the locations and from the soundtrack that I used to reproduce on set during the shoot. I wanted a character who lived the story for the first time. Could you tell us how your make up team handled the challenges of transforming David into the deteriorated creature and what guided the overall costume and prop designs? The starting idea was a character who was contaminated by the dilapidation of the context in which he lives. I wanted something that gave the idea of ​​a process of deterioration in continuous d/evolution. Together with the Makeup Artists Caterina Pelosi, Caterina Cacchiani and Sara Grandioli, we chose a ‘deteriorated’ aspect in which the context blended with the creature, allowing him to camouflage. A kind of skin moulting which changes the creature’s aspect and texture over time. We started to take references of rust textures (often from details found during the location scouting) to understand the different types and stages of rust development over time. We wanted to use material elements that looked real, so they create a dedicated workflow using pure color pigment live applied on a latex base on David’s body. The result was incredibly beautiful and realistic but very difficult to do and could also be used only once. Four preliminary tests were done on David’s face and limbs to define the style, then a makeup session on half of David’s body allowed us to understand the aesthetic effect and also to estimate the time necessary for a total body make up. On the shoot day, the makeup session started at 05:00 am, and shooting took place between 12:00 midday and 4:00 pm. Only five pre-assembled prosthetic elements were used on David’s body, while the rest was moulded on site and throughout the shooting with latex, colour, pigments and paper. For the main character’s costume we focused on the same principles of the weapon, it had to seem something archaic but at the same time also complex. After initial research on military uniforms in history we found the perfect suit for our intent with features that could raise questions for the observer. For all the story I worked trying to stimulate the spectator’s curiosity, continuously, through all the elements that were put on stage so that each element raises questions that pushed the viewer to enter more into the vision. A curious fact happened about the bullet combo. When we left for the final location I had the bullets but I did not know where to put them. During the preparation in the hydroelectric power plant this sparkling glass and stainless steel bulb stood on top of a large rusty machinery: it was perfect and it was a sign that we were on the right path! During the filming for the cabinet scene (the one in which the main character takes the combo bullet and the gas mask) the bullet combo fell and the glass was broken, so in that frame the side of the glass is hidden. Imagine what I thought: the breakage was a sign that things would not go well! Instead it happened that the Production Designer Francesco Bacci found an abandoned bottle of vodka laying around in the giant hydroelectric plant that had exactly the same diameter of the glass that had broken: fate was back on our side! As you’ve mentioned, Aerosfere’s quadraphonic session was the genesis of US, to what extent is the final soundtrack drawn from that original experience? From the very beginning of the quadraphonic sessions, Areosfere played Jim Cole and Spectral Voices tracks in his playlist in addition to other loops and samples of his own. Once the first edit was complete, Aerosfere recorded a live session watching the film projection. Guitars and keyboards were used to reproduce sounds/frequencies, instead of identifiable notes or melodies, in order to blend in coherently with the pieces by Jim Cole and Spectral Voices. Thanks to the music, the viewer slowly drifts away from reality. Music has the essential role of initiating the immersion process. Thanks to the music, the viewer slowly drifts away from reality. From the start, our intention was to use basic primeval sounds, so we oriented our research towards something connected to the human voice so it was natural for us to ‘adopt’ them as the soundtrack. The Incantation piece was played live during the shoot with the actors. Jim Cole’s polyphonic singing, very close to Tibetan chanting – whose frequencies trigger a meditative state – recalls ancestral experiences of human history. The tracks used for the short film were recorded inside a 36-metre high silo, where voices were reverberated by the structure’s geometry. Was US always conceived as a précis for the feature length project you’re currently developing? US was conceived from the beginning as a feature film, this is evident from its rhythm and from the events that happen in the story. The short is a sort of preview of the atmospheres of the feature film. Right now we are developing the script in which the identities of the two characters will be revealed and the story of US will be placed in the course of real history. A sort of dystopic and allegorical reading of the past: one of the two characters will be a reference to a well-known historical figure. Are you hoping audiences emerge from this existential trance of a film with a particular impression? As the author of course I have my idea about the meaning of the movie but I do not want to push my opinion, US has been made to be interpreted. It is always a discovery when I speak with people who have watched it for the first time, listening to the different interpretations and I think that everyone is right! Because if at the end of the vision you have your idea, the whole process has worked well. The short film was produced with cinema screenings in mind: shooting 5K RAW, color correction, soundtrack and sound design in 5.1. For a short movie it can be considered an anachronistic operation thinking about video communication that is inevitably moving towards mobile. I do not consider myself a ‘cinema integralist’, 50% of my watches are home/mobile, but I think that the cinema experience, for all its peculiar features, will always be one of the best ways to give to the audience a cathartic experience and to bring them into the foreign worlds that cinema can create. We must not forget that live experience is the only thing that can make us experience a sensory emotion.